It’s being billed as the largest RV & Boat show in the state, so if you’re dreaming of floating your own boat in one of our lakes this summer or camping in the outdoors, you may want to head over to the Convention Center to check out the show. $8/kids 12 & Under free. Spend your Saturday morning sharing a cup of coffee with the Curator of Collections of the Balloon Museum. 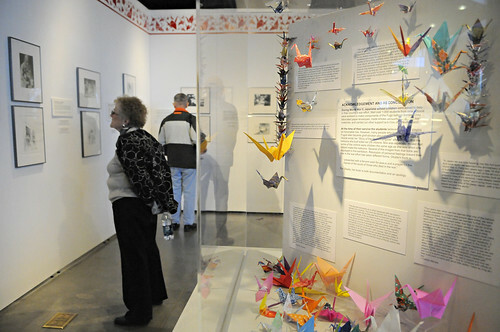 The talk will center around the exhibit Children of War, Voices for Peace: Japanese and American Perspectives – a timely discussion with our raised awareness of the current plight of those in Japan. The exhibit closes May 1. 9:30 AM; Free with regular museum admission. It’s not often that you can travel 65 million years in time on a Sunday morning hike, but that’s exactly what you can do if you join UNM Continuing Education‘s guided hike in the San Juan Basin. This hike is ideal for reasonably fit, experienced cross country hikers. Fee includes transportation and guide. 8AM – 6PM; $85.00. You must pre-register; check the website for instructions on where to meet up. This entry was posted in Event Recommendations and tagged ABQCityLife, Albuquerque, Albuquerque Convention Center, Anderson Abruzzo Albuquerque International Balloon Museum, APPCityLife, Boat & Travel Show, Ceja Pelon Badlands, Children of War, City of Albuquerque, Events, hiking, New Mexico, New Mexico RV, San Juan Basin, UNM Continuing Ed, Voices for Peace: Japanese and American Perspectives. Bookmark the permalink.